Curling is thought to have been invented in medieval Scotland, with the first written reference to a contest using stones on ice coming from the records of Paisley Abbey, Renfrewshire, in February 1541. Two paintings (both dated 1565) by Pieter Bruegel the Elder depict Dutch peasants curling—Scotland and the Low Countries had strong trading and cultural links during this period, which is also evident in the history of golf. Evidence that curling existed in Scotland in the early 16th century includes a curling stone inscribed with the date 1511 (uncovered along with another bearing the date 1551) when an old pond was drained at Dunblane, Scotland. Kilsyth Curling Club claims to be the first club in the world, having been formally constituted in 1716; it is still in existence today. Kilsyth also claims the oldest purpose-built curling pond in the world at Colzium, in the form of a low dam creating a shallow pool some 100 × 250 meters in size, though this is now very seldom in condition for curling because of warmer winters. The word curling first appears in print in 1620 in Perth in the preface and the verses of a poem by Henry Adamson. The game was (and still is in Scotland and Scottish-settled regions like southern New Zealand) also known as "the roaring game" because of the sound the stones make while traveling over the pebble (droplets of water applied to the playing surface). The verbal noun curling is formed from the Scots (and English) verb curl, which describes the motion of the stone. In the early history of curling, the playing stones (or rocks) were simply flat-bottomed river stones that were sometimes notched or shaped; the thrower, unlike those of today, had little control over the stone and relied more on luck than on skill and strategy. It is recorded that in Darvel, East Ayshire, the weavers relaxed by playing curling matches. The stones they used were the heavy stone weights from the weavers' "warp beams," fitted with a detachable handle for the purpose. Many a wife would keep her husband's brass curling stone handle on the mantelpiece, brightly polished until the next time it was needed. Outdoor curling was very popular in Scotland between the 16th and 19th centuries, as the climates provided good ice conditions every winter. Scotland is home to the international governing body for curling, the World Curling Federation, Perth, which originated as a committee of the Royal Caledonian Curling Club, the mother club of curling. Today, the game is most firmly established in Canada, having been taken there by Scottish emigrants. The Royal Montreal Curling Club, the oldest established sports club still active in North America, was established in 1807. 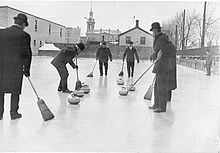 The first curling club in the United States was established in 1830, and the game was introduced to Switzerland and Sweden before the end of the 19th century, also by Scots. Today, curling is played all over Europe and has spread to Japan, Australia, New Zealand, China, and Korea. The first curling club in the United States was organized in 1830, only 30 miles from Detroit, at Orchard Lake, Michigan. Called the Orchard Lake Curling Club, the club used hickory block "stones." The Detroit Curling Club was started in 1840 when Michigan only had a population of 212,000 and had only been in the Union for three years. About this time, an organization called the "Thistle Club" was founded and, curling being a winter sport, was played when the ice was suitable on the Detroit River at the foot of Joseph Campau, on the bay, and at the old Recreation Park. These clubs became the Granite Club, and in 1885 the present Detroit Curling Club was organized. *I will play the game with a spirit of good sportsmanship. *I will conduct myself in an honorable manner both on and off the ice. *I will never knowingly break a rule, but if I do, I will divulge the breach. *I will take no action that could be interpreted as an attempt to intimidate or demean my opponents, teammates or officials. *I will interpret the rules in an impartial manner, always keeping in mind that the purpose of the rules is to ensure that the game is played in an orderly and fair manner. *I will humbly accept any penalty that the governing body at any level of curling deems appropriate, if I am found in violation of the Code of Ethics or rules of the game. *Shake hands with your opponents before and after each game. *Opposing players will toss a coin at the start of the game to determine last stone advantage. *When your opponents are preparing for delivery, stand to the side of the sheet, single file and between the hog lines. Move only after the stone has been released. *If you are throwing next you may stand on the backboard, but remain quiet and out of sight of the opposition thrower. *Only skips and thirds may congregate behind the tee line. They do not move or hold their brooms on the ice while the opposition is preparing to deliver a stone. *Wear clean, appropriate footwear that will not damage the ice. *Be ready to go when it’s your turn to deliver a stone. *At the conclusion of an end, all players remain outside the rings until the opposing thirds have agreed on the score.